I’ve seen anti-spoofing mentioned on #illumos and #openindiana a few times but googling it turns up little information. Although I didn’t check it out until rmustacc‘s adviced me to do so regarding a KVM IPv6 issue I’m facing. After asking around about it and and some further research it also seems to go by the name of Link Protection in the Oracle Solaris documentation. I only found this out by actually figuring out what I had to set using dladm and then googling the parameter. So what is it and do I need it? Link protection protects you from zones or (k)vm’s that try to behave badly. For example a vm could set a different IP or try to change it’s MAC-address. In most cases you do not want this to happen. I’m sold! How do I use it? Well you can set different modes: ip-nospoof, dhcp-nospoof, mac-nospoof and restricted. They can be used in any combination you want. ip-nospoof: limit outgoing traffic from source IP’s learned through DHCP or the allowed-ips property. mac-nospoof: prevents zone admin from changing the mac address. dhcp-nospoof: prevents Client ID/DUID spoofing for DHCP. restricted: only allows IPv4, IPv6 and ARP protocols. You can configure this using dladm set-linkprop command. You can find some practical examples in the quick reference section below. For some reason this is disabled by default in most distributions with the exception of SmartOS. This can be further restricted using allowed-dhcp-cids in similar fashion as allowed-ips. If allowed-dhcp-cids is not set, the interface’s MAC will be used. Hopefully this has been useful for you all! As mentioned in my previous Solaris related post, I’ve recently started using Solaris. What I didn’t mention is that I briefly use Oracle Solaris 11 11/11, but quickly went to OpenIndiana. I personally did not like the way Oracle is doing things. Plus the added benefit of KVM and some extra goodies here and there. I will now show you one of the neat things that will probably never make it into Oracle Solaris. This little switch for svcs will print the logs for each service. Normally you need to use -x to then manually extract the path from the output. Say you want to view the log for the build in SMB server, all you need to do on a Illumos based distribution is the following. To quote Bryan M. Cantrill “Small tools doing well defined things.”, this is why I love UNIX. If you didn’t know about this already, you will love this! If you did know about it, you already love this! Here is a short tutorial on how to setup a multi stage authentication with an Apache HTTPd 2.4 server. The first stage will do a 2-way SSL encryption, so both server and client will need to present a certificate. The second stage will be password authentication, the username has to match the username in the CN of the client certificate. This is similar to the Belgian eID, instead of needing a PIN to unlock the certificate. We require a certificate and a password. Although this is not 100% the same, the security it offers is comparable for most purposes. In my 2 test cases the password is queried from PAM, but a simple htpasswd file will work as well. I assume you can configure a normal SSL based virtual host on httpd and have this working. I also assume you are able to sign and create the clients certificates yourself using openssl and a private CA. If there is demand, I may write a short post on that at a later date. It is very important to include your CA, it is required for client certificate validation. I also recommend setting the Certificate Revocation List, that way you can revoke access to compromised client certificates. You can also set this to optional, this can be useful if you have a portal to retrieve the client certificate. But it’s safer to have it set to require for the entire virtual host. This is the second stage of the authentication, I’m using mod_auth_external in combination with pwauth to authenticate against PAM. This makes it easy for users with shell access to change their own passwords, however you probably want to use file base authentication instead. Every authentication provided should work. Here is where the magic happens! This is why this only works on 2.4 branch: we can now nest requirements! The <RequireAll> block will require all the require statements inside to validate to true, if not the request is rejected. Of course the validity of the certificate is already checked by SSLVerifyClient. This is probably where the most editing will be needed to get this to fit your needs. The main example also has a alternative, with a workaround for pre 2.4.3 releases. There seems to be some issues with file uploads, setting the SSLRenegBufferSize large enough seems to solve this. I previously mentioned rpmbuild. I wanted to write a little post on what it does and how useful it is. But I though it would be easier to just show you. So what is rpmbuild? It is a tool for building rpm packages based on a spec file. The resulting rpm should be close to the rpm provided by your distribution. I’ve used rpmbuild on both Fedora and CentOS to create Apache HTTPd 2.4 binaries that works as a drop in replacement for the system ones. So how does it work? I’ll just show you! You need to install rpmbuild first. Download the apr, apr-util and httpd source code from apache.org. Then simply run rpmbuild against the tar archive. This is far from a step by step, but it should give you a general idea what rpmbuild does and how it can be used for building binaries on CentOS or another rpm based distribution. Rpmbuild will point out which packages you are missing, just install them and you should be fine. You may also experience an error on the new apr-util, if you do get the patch posted here. I was looking for a new headphones/microphone combo. I’ve got a game PC again, so I play at night from time to time and keep my mother awake due to not having a headset. I also needed something for Skype. For my Game PC I could use the on-board analog plugs. But things like watching movies and anime, listening to music,… I do from my MacBook Pro. 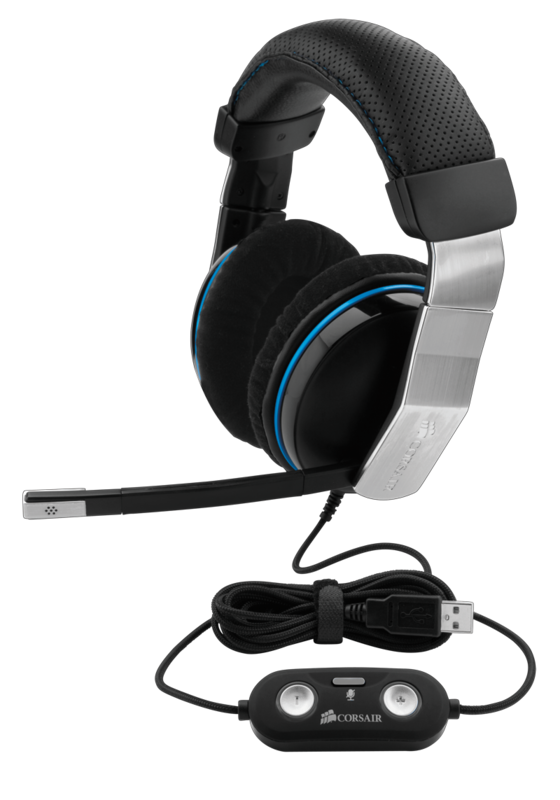 I ended up going for the Corsair Vengeance 1500 Dolby 7.1 USB. Although it was not mention on the Corsair product page that it worked on OSX, I did find some people who got it to work. I’m now one of those 🙂. So what about quality? I’ll be short. Feels sturdy, mostly plastic with some metal but feels very nice. The cable is also one of those nylon ones, I really like those so that is a plus for me. I’m no audiophile, but they sound pretty decent when listening to music. Nice deep bass, high notes seem clear as well. I played some action scenes from some movies I had laying around, they sound wonderful too, as good or maybe even better than my external 6.1 speakers from Logitech. Do note this was on mac so I have no idea if the 7.1 was working or not. The microphone is also very clear, way better than the bluetooth earpiece I’ve been using. During gaming there is a slight crackle, however this was only in UT3. I did not have this issue with steam games. I do have a slight discomfort where the headphones are a bit tight, but I have that with all headphones so I can’t really flow them for that. Overall my first impression is very good. Here is a little trick to connect to a server that requires a SSL Client certificate when your client does not support it. To make it work your client must be able to use a proxy. We will use this proxy to rewrite certain servers to a reverse proxy that injects the client certificate. Lets get to the good stuff! We will filter out request for secure.blackdot.be and repository.blackdot.be, then we send the request to our reverse proxies. Other request will be passed along untouched. The proxy is listening on port 8080. The reverse proxy on port 9901 will proxy the requests to secure.blackdot.be, it will offer the client certificate stored in conf/ssl/RP9901CERT.crt. You would create a similar reverse proxy on port 9902 for repository.blackdot.be. This should be enough to get this working, if not… your probably shouldn’t be using SSL Client Authentication. Welcome to Solaris, have a beer. I’ve recently moved away from Linux to Solaris (OpenIndiana more specificly) for my NAS. Although I like the Linux community, the Solaris one is totally different. 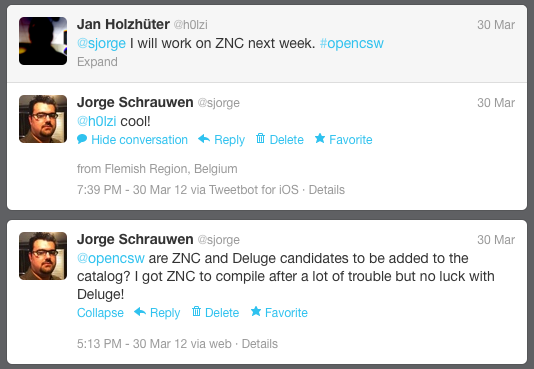 Note: I’m talking about the Illumos Kernel, Distro’s like SmartOS and OpenIndiana and projects OpenCSW. It’s not a huge community, to me this is part of the appeal. You see a fair amount of the same people in the channels of the respective open source projects and efforts. This is very pleasant. Overall I find them all to be very helpful! And yes, I did get a nicely packages ZNC out of this. It require some back and forth between me and Jan, but it was a very pleasant experience! So I’d like to thank you all for the very warm welcome! If you have an urge to try Solaris, do give into it! But just skip the Oracle Solaris 11 11/11 stuff and get to the good stuff over at the distribution page on the Illumos wiki. Update July 31st, 2012: while working on a comparison of Illumos distributions I got this response. <meth> sjorge: What's up with the OI installer? I replied by kindly stating what I think could be improved, most of those had a incident in there tracker already! Awesome. Comments Off on Welcome to Solaris, have a beer. I have one Arch server left at home, it is behaving badly. It has some fairly new stuff on it so I can’t replace it with CentOS. I should be able to replace it with a new Fedora. So I hunted for a minimal install image… nothing! Netinstall? Ofcourse not! Oh well, nothing to do about it. Let’s give them what they want… then clean house. Hey it’s MY os! You now have a very small Fedora install without X Window System or a desktop environment. Just the way I like it. Quick reference: http://fedoraproject.org/wiki/SysVinit_to_Systemd_Cheatsheet — I use systemd far to little. As you have guessed, I’m a linux geek. I used to be of the bearded kind even. So here is a bit of my history with linux for those who are interested. It all started back in the day with my old Compaq laptop somewhere around 1999, ‘t was the eve before Win2k. A Mandrake disk came with a computer magazine, my laptop was broken so I though I’d give it a try. Most things worked, aside from X11. Due to it being a laptop, it had bad support back in the day. I’ve gradually used linux more and more to the point I now use it nearly exclusive for all my servers. I use it most other hardware too. My macbook pro excluded. Believe it or not, blackdot.be ran on Gentoo until the last migration. Now it runs on CentOS. I’ve come to value my time more lately. Stability is good. Zimbra works fine on CentOS 6. I only had to compile httpd 2.4 branch. Oh boy the joys of rpmbuild! Expect an article on this in the future. Why this nostalgia all of a sudden, well it’s good to know ones roots. Most new linux users have always known GUI’s. But I’m a CLI man. This will explain my upcoming post! Arch, you have a special place in my live. You are perfect! But, for now CentOS will run on my servers. Hopefully you have enjoyed this bit of trivia and nostalgia! Due to popular demand (I got 1 e-mail, but hey they’ve been gone for a few days). I’ve added some of the old Apache HTTPd 64-bit binaries to the download page under archive. Please use them with care. It is possible I’ll redo the compile tutorial at some point but I currently don’t have access to a compiler.